← The Oregairu Drama CD is Now Subbed on Youtube! Now, the show’s not ultimately concerned about the “great responsibility” that comes with “great power” Spiderman spiel. It’s more thematically concerned with discussing chuunibyou tropes, eccentricities in general, and aspects of otaku culture. Frog-kun: So we’re talking about Inou-Battle then. Right… then..? R-Right then. It’s a pretty good show, I guess. Had its ups and downs. Its inconsistency was one of the more interesting things about it. There are parts of the show which actually play out the chuuni fantasy and other occasions where it’s discussed through a “reader’s” or even the “outsider’s” perspective. The focus of the show was really haphazard, but at least it tried to say something different in each episode. ZeroReq011: It plays its cards close to the more cliche things you’d find in anime romcoms and anime humor in general. There’s a certain self-aware, sarcastic wit to it that makes many of the show’s cliche gags pretty entertaining and pretty clever in some ways. Then there were others that ended up being pretty uninspired. 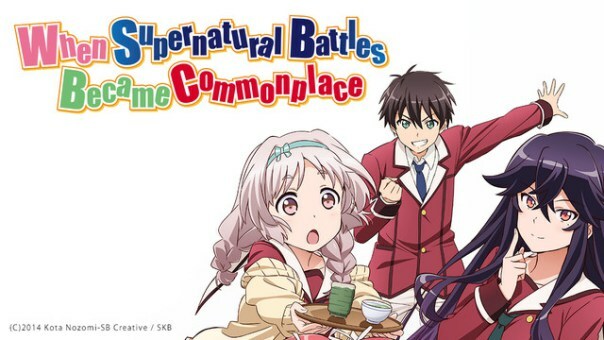 Inou-Battle some outstanding dramatic highlights though, and it’s shone interesting insight on a number of themes. ZeroReq011: Among the different themes Inou-Battle commented on was the chuunibyou fantasy. You’ve made a post about the chuunibyou aspect of the show before, no? ZeroReq011: Chuunibyo demo Koi ga Shitai!, or Love, Chuunibyou, & Other Delusions! was obviously the show that made the chuunibyou condition popular as an anime trope. Do you know whether or not chuunibyou was a fully realized thing in Japan before Yuuta and Rikka made their debut? Frog-kun: The term “chuunibyou” was said to be coined by the Japanese comedian Hikaru Ijuin back in the 90s, but the term has picked up steam in recent years, particularly among light novel readers. Remember the chuuni character Zaimokuza from the Oregairu novels, who really wants to be a light novel author? And remember how Tomoyo in Inou-Battle is initially embarrassed to admit she wants to write light novels because people will think of her as chuuni? The way I see it, writing light novels is on the same tier as writing epic Tolkien-inspired fantasies back in high school. ZeroReq011: Attempting, and failing miserably. Frog-kun: Who hasn’t attempted something like that or knows someone who has? ZeroReq011: Characters may be more than their chuunibyou in certain respects, but the chuunibyou part of them is presented as more a foible than anything. 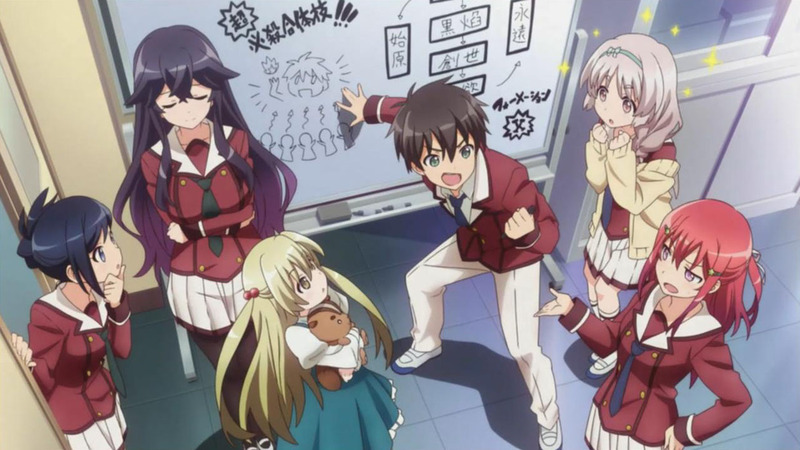 Inou-Battle takes the different route of portraying it positively. Not unconditionally, mind you, but in a manner that’s not too different from more eccentric folk who take on eccentric hobbies. You can apply that to geeky hobby enthusiasts, and no doubt anime and manga are somewhat things of a geeky nature to indulge in. Consuming animanga culture the way fans of anime do is rather eccentric by mainstream society’s standards. More so for us because we’re relatively open about it. ZeroReq011: There’s always this friction that’s generated when niche and mainstream opposites approach each other, but these geeky hobbies get a bad rep of self-absorption, of people obsessing hours and weeks and years over their geeky games, geeky shows, or geeky literature that they disconnect from reality and morality. There are obviously people that do disconnect from reality (I obviously don’t recommend that), but the majority of us know the boundaries, more or less. We can be eccentric. We can be social. Neither’s mutually exclusive from the other, but that does require that we be self-aware and critical of how we behave. Frog-kun: Speaking of being open about one’s hobbies, the other day one of my friends literally referred to his little sister as his “imouto,” right in front of his little sister and mother. Frog-kun: He was having fun. But about whether there’s something shameful about geek hobbies, I’m of two minds about this. 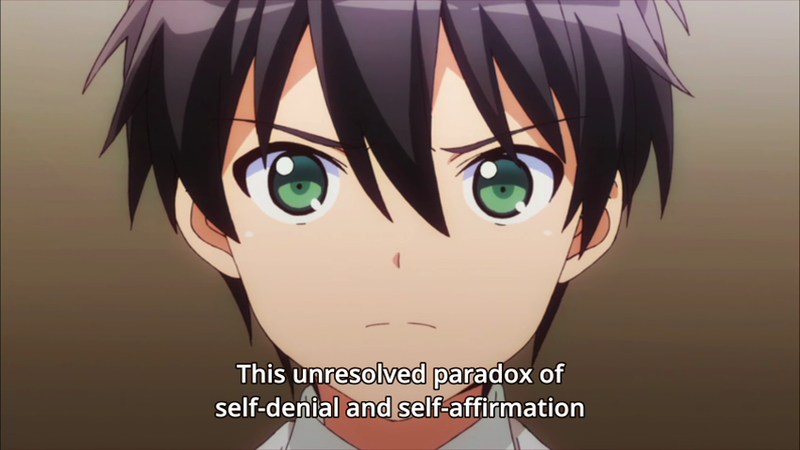 I think the exaggerated chuunibyou archetype is a self-deprecating joke on geek hobbies, which is why a lot of people who are no longer teenagers can still identify with it. I disagree that anime and manga portrays this negatively. I think on the whole, it’s portrayed as an endearing joke. Deprecating, but endearing. Inou-Battle makes that its main focus, though, and actively analyses it. Frog-kun: For instance, on the one hand, Andou strives to be totally open about his chuuni hobbies and his play-acting. On the other, Hatoko can’t understand him. 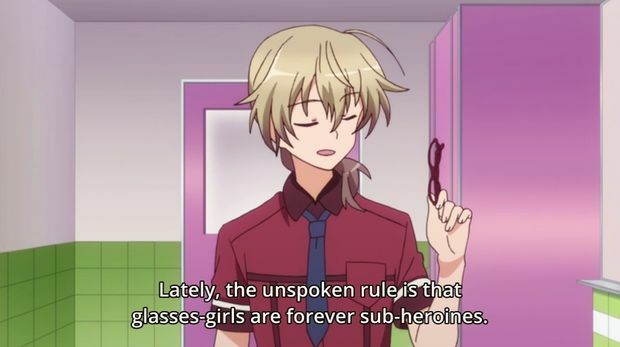 He connects best with Tomoyo who is a chuuni (though in denial) just like him. Geek hobbies can exclude others, even as geeks form connections with each other. What do you think of this? ZeroReq011: Oh, no doubt. Reminds me of the “I Am a Gamer!” speech in Log Horizon S2 Episode 10. Extending geek hobbies from chuunibyo and animanga to gaming, you can see how gamers end up retreating from people in the real world into their own virtual worlds, all the while making companions of the people in the virtual worlds they retreat to. We want to be understood and accepted for what believe is who we are, but in the process, our unwillingness to compromise, consciously or not, alienates other people. We become unable to make friends with people who don’t understand, and those people who don’t comprehend yet want to be close with us are unable to feel that proximity. A somewhat vicious cycle perpetuated in part by our own viciousness. Now that you mention it, Hatoko’s “I Don’t Understand!” monologue in Episode 7 additionally saves Andou’s character from being Mr. Perfect, but with chuuni. The monologue’s length was breath-chortling, and it’s execution was breath-taking. To be perfectly honest with you though, I thought Inou-Battle could have dragged this issue of self-complicity out longer. Andou got slapped pretty hard by Tomoyo, sure, but then Hatoko was saved after being abruptly kidnapped by a magical subplot diversion, and everything sort of just went back to commonplace. Frog-kun: I get the feeling the author wasn’t sure how to answer the questions that monologue brought up. 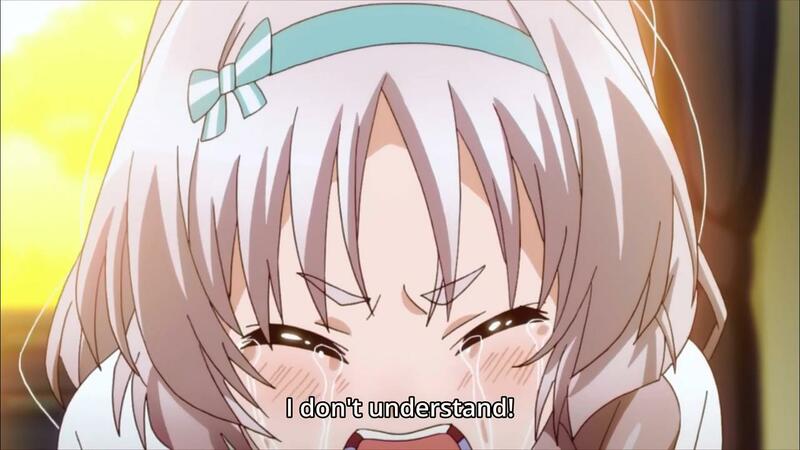 How can you remain chuuni while still connecting with people that don’t understand your particular interests? I think that’s a question young people are concerned with very much, although as we get older, we tend to realise that everyone else in the world has interests we’ll never entirely understand. And that’s not such a big tragedy. I guess what I’m trying to say is that this isn’t just a problem faced by people with geeky interests. But besides that one scene, Inou-Battle doesn’t quite go far enough articulating Hatoko’s point of view, which is probably why that arc’s resolution was ultimately so disappointing. ZeroReq011: What was also disappointing was the introduction of the “fairy war” subplot. I think isolated, the episode that really went out of its way to introduce this subplot as a thing is fun in itself. Like if you knew nothing about Inou-Battle and you got into the series watching Episode 8 first for some reason, I doubt the community reaction to it would be as severe as it had been. Of course, from a flow-of-narrative standpoint, plopping it down where it was like a drunk driver doing a hit-and-run. Episode 7 hit a very tender thematic nerve, and Episode 8 ran away from addressing this theme with all the sobriety and sincerity it deserved. It then lightly touches on the subplot further, though without much coherency. That being said, Episode 8 did allow the show an excusable means to almost directly comment about otaku thinking on things like self-inserts and shipping. It was Episode 9, I think? Frog-kun: Yep. Sagami’s role was like that of the fanfiction author. He just knows the harem tropes and consciously manipulates them, all for the sake of his shipping. Of course, he has ulterior motives as well related to the “fairy war” subplot, but since that’s unresolved, what we’re left with is a character who remains fairly inscrutable to the audience. His lines, though, are familiar to anyone immersed in fandom culture. He talks in tropes. “Sayumi can’t win because she’s a glasses character!” He (correctly) identifies her as a side character in the scheme of things. He wants her to win so he scripts out events to his own liking. As fascinating as this sounds from a meta-storytelling perspective, there was a downside to this plot development as well. Andou, who had up until then been an interesting character with realistic flaws, becomes a passive character whose main characteristic is that all the girls like him. Frog-kun: Speaking of harems, though, what did you think of the harem set up with Inou-Battle? 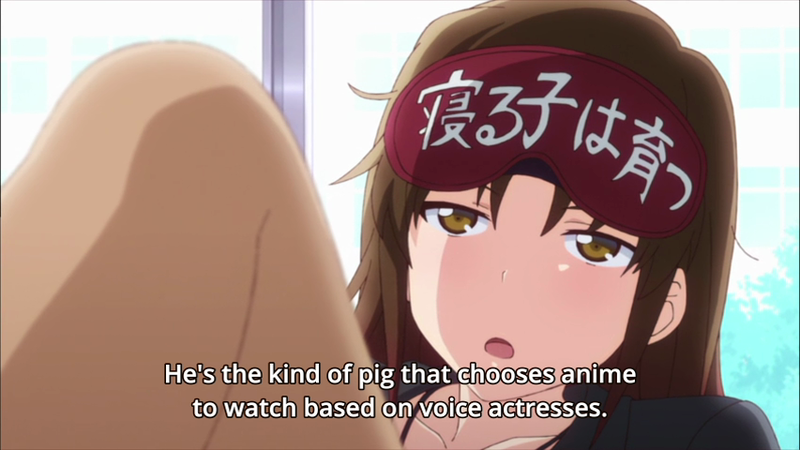 You’ve mentioned before that you’re not a fan of the genre, but here we are discussing an anime that’s just chock full of stereotypical harem moments. ZeroReq011: Pseudo-harem set up. 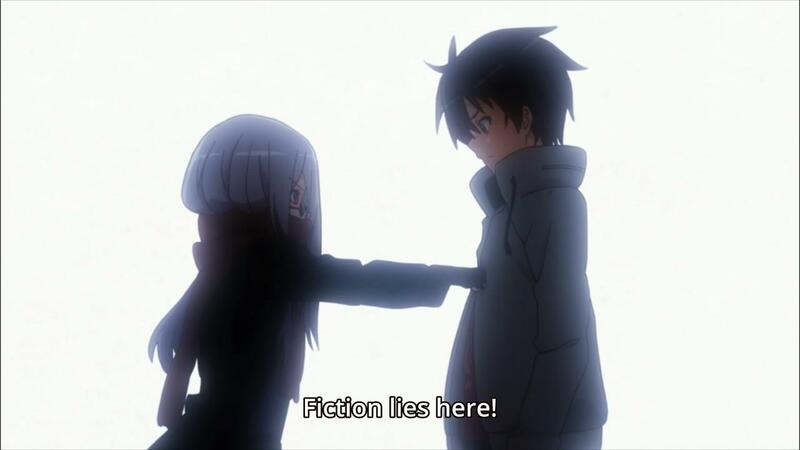 The show might have played around with anime harem tropes as much as Andou played around at being chuunibyou, but it also knew the boundaries, and it made sure, to a large extent, to keep harem antics and the overarching themes separate. I’m a rather self-serious person when it comes to the media I watch, and harems, to a large extent, aren’t really serious attempts at depicting, commenting, or exploring human relationships. I may be amused at times, but ultimately, I can tolerate harem for so long until I need something else to give me substance, as in the case with Inou-Battle. That being said, I kind of hoped Inou-Battle might have taken down its harem elements down its more realistic conclusion of being untenable, similar to perhaps the narrative direction of White Album 2, but it didn’t. Wasted potential, particularly with Sayumi and Chifuyu (not to say their individual character arcs weren’t interesting in themselves), but oh well. Frog-kun: In the end, Sayumi and Chifuyu were pretty useless. I was, however, impressed by how the camaraderie between the literature club members transcended the romantic tensions. It felt like they were all close friends first, love interests second. ZeroReq011: You know, Frog-kun. We’ve been talking chuunibyou and other stuff all serious-like, but we should close this piece with something funny. Frog-kun: What do you have in mind? ZeroReq011: You’re a recovering chuunibyou, no? Frog-kun: Nooooooooo how could you tell? ZeroReq011: I am God. Tell us. ZeroReq011: I am God. Continue. Frog-kun: For the better part of eighth grade, I-I wore leg weights underneath my pants. Just like Rock Lee. I was totally training to be the fastest runner in my grade. ZeroReq011: I-I know we agreed to offer personal anecdotes for this piece, b-but I’m not your damn therapist. Frog-kun: Wait, didn’t the script call for you insulting me during that? Frog-kun: Did I make you uncomfortable? ZeroReq011: C-Can we end this piece now? Frog-kun: Huh? Why? We were just getting to the good part! ZeroReq011: You have anything more to say about Inou-Battle? Note: You can also read this post on ZeroReq011’s blog. 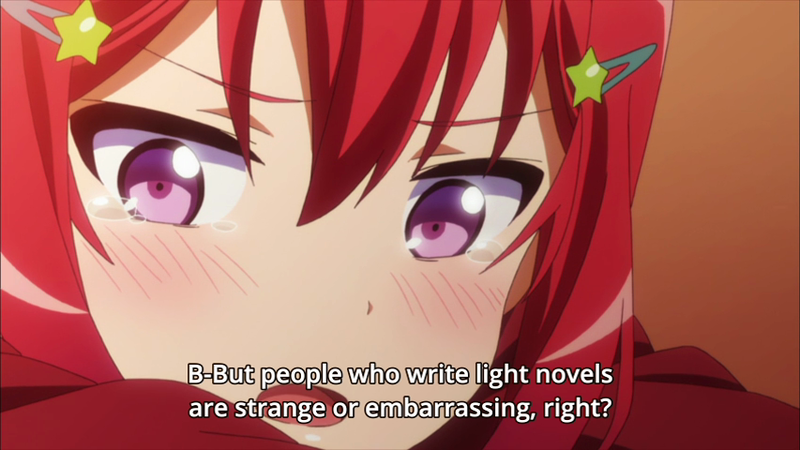 Posted on January 11, 2015, in Anime Analysis and tagged BEST GIRL, chuunibyou, chuunibyou demo koi ga shitai, inou battle, naruto, shakespeare. Bookmark the permalink. 24 Comments. It’s quite an interesting enigma though, being chuunibyo. On one hand, as a human being we always strive for connection, to be understood and to be acknowledge. However, at the same time chuuni become eccentric themselves (out of geek hobby consumption etc.) because out of desire to become somewhat “different” and “special”. The refusal on conformity. To a degree I can understand that feeling, because I do think I was like that from time to time. Even though it didn’t manage to tackle or explore theme fully, Inou-battle is still an interesting series to watch. Well, for me anyway. Sooo, did the chuuni experience on the closing part is true or not may I ask? Namhur, I’m amazed. How could you mention chuunibyou and The Lego Movie and not mention Batman? So what are the good bits? Don’t leave me hanging. I have absolutely no idea what I’m doing on this blog but the younger selves anecdotes killed me. Thank you bro. Wow, you two really did go all out on this haha. Froggy even got a “Tomoyo Best Girl” in before the end. What more could you want in such an aniblogger-decadent post such as this? This further solidifies my decision not to watch Inou Battle. However, I must learn the tropes immediately. Say, do you think how close is Perfectionist to Chuunibyou? It’s very easy for someone over-concern with settling everything right to exclude himself from this world. Even if something perfect exist, to co-exist with imperfection itself is imperfect. Then, the question of Staying the Same with Moving Forward. Your dream change everyday, right? There are similarities between perfectionism and “chuuniism.” Both involve delusions when taken to their extremes, but I suppose the main difference between the two is that perfectionism is something that can be broad and/or flexibly applied to a host of different things, whereas “chuuniism” applies to one specific thing. You think so, Zero? I think “chuuniism” is very broad as well. It’s basically just another word for the teen complex. It’s not just play-acting power fantasies – it’s buying into this idea of self-importance and that you’re somehow special and misunderstood. I suppose the difference between perfectionists and chuunis is that chuunis aren’t necessarily motivated to complete things or to achieve a certain standard. But I think they come from a similar emotional impulse: holding yourself to a different standard than everyone else. Well, it’s not like the achievement of “different” standards are mutually exclusive from “certain” standards. I lumped the equivalent of “teenage complex” as one thing, and it’s true that you could probably break “teenage complex” into multiple behaviors, but its accurate application is still narrower than that of perfectionism. Oh, so “chuuniism” can also encompass general teenage apathy and antipathy? Like the Holden Caulfields of Catcher in the Rye fame can be considered chuunibyou? Has the term “chuuni” been used as broadly as you say to describe people in other shows, other films, and other literature? Well, for now “chuuni” is just a word that’s used in Japanese circles. I also think we English speakers think of it as having slightly different connotations than Japanese speakers, because we tend to associate chuuni with the play-acting angle because of anime. There are three main types of chuuni, and one of them, the “subcultural/hipster” type, does seem pretty close to Holden Caulfield and his ilk. Well now, that might have been something to include in the piece, huh? Then, the most important is a big ‘I’? You know, I notice that except yourself, each individual usually categorizes their social connections: For example “Family”, “Hipster”, “Useful”, “That guy is a jerk” => Even a normal human has a different standard when it comes to himself. So what is different with Chunni? Anyway, I think the difference between a normal person and a chuuni is simply a matter of scale. Chuunis display a more exaggerated ego, but because everybody is egoistical to a degree, I think anyone can relate to chuunibyou to a degree. btw since I haven’t watched the title, were these kanji with the furigana from the episode or your trick? As for the kanji readings, some of them were derived from the show, although I came up with most of them. Coming up with alternate kanji readings is a common chuunibyou thing, so we decided to pay homage to that with our titles. Yeah I imagined as much (that is chuunibyuu). I’ve only watched the infamous breakdown scene. And I finished reading the 1st vol of your translation of Oregairu (Zaimokuza can’t be ignored that easily) [I think I’ll avoid reading further since the S2 is coming out soon]. I really liked what you came up with especially in relation to the structure of your post!